Discuss the role and value of laws in society with regard to crime and crime prevention. Include in your discussion the definitions of "crime" and "crime prevention." 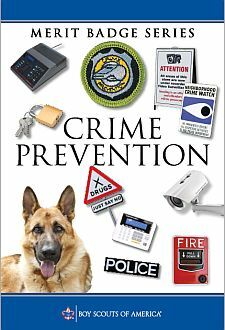 Prepare a journal from various sources that addresses crime and crime prevention efforts in your community. After doing EACH of the following, discuss with your counselor what you have learned. Using the checklist in this (the merit badge) pamphlet, conduct a security survey of your home and discuss the results with your family. Teach your family or patrol members how to protect themselves from crime at home. at school, in your community, and while traveling. Create a poster for display on a school bulletin board. With permission from school officials, create a page long public service announcement that could be read over the public address system at school or posted on the school's website. Make a presentation to a group such as a Cub Scout den that addresses the issue. Assist in the planning and organization of a crime prevention program in your community such as Neighborhood Watch, Community Watch, or Crime Stoppers. Explain how this program can benefit your neighborhood. With your parent's and counselor's approval, visit a jail or detention facility or a criminal court hearing. Discuss your experience with your counselor. The potential consequences from the misuse of prescription drugs. The role of a sheriff's or police department in crime prevention. The purpose and operation of agencies in your community that help law enforcement personnel prevent crime, and how those agencies function during emergency situations. Explain the role private security plays in crime prevention. Choose a career in the crime prevention or security industry that interests you. Describe the level of education required and responsibilities of a person in that position. Tell why this position interests you.